Looking to visit a peaceful town that's full of interesting attractions? Well, my husband and I highly recommend Georgetown on the South Carolina coast. Originally established in 1729 as a shipping point for rice and indigo grown on area plantations, this cute little seaport on the Sampit River is historic yet Mayberry-esque. You'll admire the 32-square-block downtown district that's listed on the National Register of Historic Places (keep an eye out for the light-blue markers that identify historic structures) and love the friendly hometown atmosphere. Georgetown is still an active seaport; you can watch shrimp trawlers unload their catch daily. The streets, lit at night with old-fashioned lanterns, were never crowded, and many unique shops and attractions are just a short walk from each other. We found great antique stores on Front Street, the town's main drag, with lovely residential neighborhoods just a short stroll away. We also enjoyed the landmark 1845 clocktower at the junction of Front and Screven Streets… the art-deco Strand Theater… graceful LaFayette Park… and the scenic Harborwalk, a 12-foot-wide boardwalk along the Sampit. On this historic side, don't miss the interesting Rice Museum (633 Front St.; 1-843-546-7423; open 10 a.m. to 4:30 p.m. Monday through Saturday; $5 for adults and $2 for those ages 12-21 )… the 1769 Kaminski House (1003 Front St.; 1-843-546-7706; open 10 a.m. to 4 p.m. Monday through Saturday; $5 for adults and $2 for children ages 6-12 )… and lovely churches such as the Bethel African Methodist Episcopal Church (417 Broad St.), founded by Afro-Americans after the Civil War, and the Prince George Winyah Episcopal Church (708 Highmarket St.), built around 1750 from bricks used as ballast on British ships. During our stay, we relaxed at the Harbor House Bed-and-Breakfast (15 Cannon St.), right in the heart of the historic district. This lovely mansion offers four guest rooms, all with harbor views. I don't usually like grits, but innkeeper Meg Tarbox's shrimp-and-grits breakfast casserole was a delight! For a great side trip, consider a pontoon-boat excursion offered by Cap'n Rod's Lowcountry Plantation Tours. (705B Front St.; 1-843-477-0287 or lowcountrytours.com. Fares are $20 for adults and $15 for children age 15 and under; offered Monday through Saturday. ) Tram tours of the town are also available; for details, stop at the Visitor Center (10001 Front St.) or call 1-843/546-8436. Our favorite places to eat were the elegant Rice Paddy (732 Front St.; 1-843-546-2021 ), where the pasta and peppermint ice cream were excellent)… and Thoma's Cafe (703 Front St.; 1-843-546-7776 ), famous for its crab cake sandwiches, fried-green tomatoes and gumbo. So whether you're looking for a romantic getaway or an action-filled vacation, drop anchor in Georgetown! 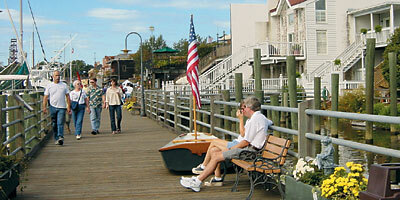 Georgetown is on South Carolina's central coast, where U.S. Highways 17, 521 and 701 meet, about 60 miles northeast of Charleston and 34 miles southwest of Myrtle Beach. 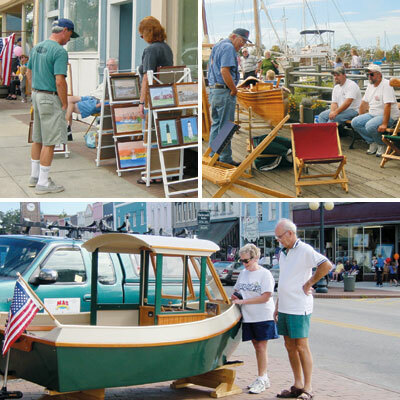 To learn more about the town and the surrounding Low Country Region, call the Georgetown County Visitors Bureau at 1-866-368-8687 or consult hammockcoastsc.com. For details about the Harbor House, call 1-877-511-0101. Rates are $135 to $155 a night for single or double occupancy, including breakfast; closed December 15 through February 10. Charleston boasts a bevy of interesting attractions. Stunning Brookgreen Gardens is in Murrells Inlet, about 20 miles northeast of Georgetown on Highway 17.